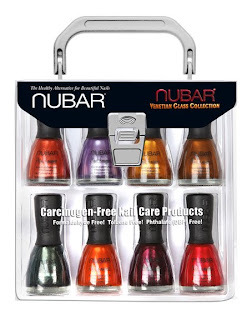 nubar's Prism Collection is released today, and has received a warm reception in reviews. 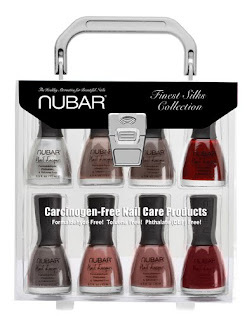 Kelly of Vampy Varnish says, "Nubar’s formula is most excellent these are all just top notch, I had no issues whatsoever. They are very holographic also, not just a little bit," and Anne at Beauty Xpose notes that, "All of the nail polishes glide on evenly without chunky glitter poking through the top as you might expect; the glitter lies flat, resulting in a smooth, glass-like finish." Scrangie's enthusiasm for the collection was clear when she said, "I was way too excited to wait for appropriate lighting for swatches, so I snapped a few pics in the dark of the Nubar Prism samples that just arrived." Various reviewers have skillfully photographed the Prisms, previewing the eight holographic shades. Beauty Judy shows Jewel and says, "The brown goes so well with the colors of the rainbow. I blurred this pic a bit so you could see those glitters!" Getcha Nails Did shows Spark and tells her readers, "I'm loving this sable colored holo shimmer. Even though I would consider this a "mature" color I really, really liked it on. I think this would be a great polish for those of you with job's that restrict your nail polish colors." Polish or Perish shows Gem, saying, "I think this is my favorite one of the collection. There's something really unexpected about this polish." 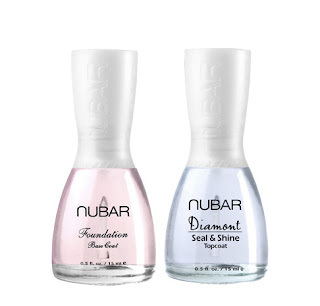 The Prisms retail for $9.49 each, and are available now at www.bynubar.com. These are just stunning! I can't wait to get these! 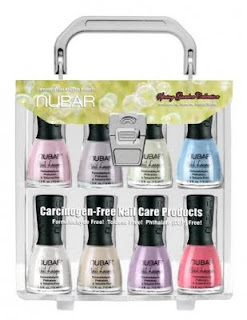 i love the nubar but i live in france ad we don't have a seller for them and our website don't ship in france :( do you know what we can do for have nubar nail poilsh ? What an amazing collection! I wish nubar was available in the Netherlands.